Chris Daughtry’s traditional approach to songwriting is doing the music first and then putting lyrics to it—but when he started writing “Baptized,” the opening title track to his newly released fourth album, with new collaborator Claude Kelly, he says the words, “Take me down by the water” poured out immediately and the concept of the song took shape very quickly. The song, produced by Martin Johnson (who is also credited as a co-writer), became the perfect metaphor for a collection that finds Daughtry making a new creative start for himself and his eponymous band after three hit albums produced by Howard Benson. Baptized’s lead single, the electro-pop driven “Waiting For Superman,” sold 53,000 downloads its first week on the Billboard Hot 100 and debuted at #25 on Billboard’s Hot Digital Tracks chart. It also hit #15 on the Adult Pop Songs chart. 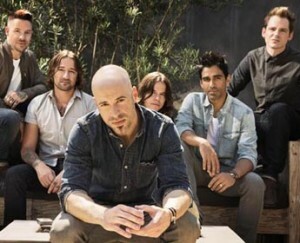 “The song ‘Baptized’ isn’t a spiritual or gospel song in the traditional sense, but I wanted it to have that ‘O Brother Where Art Thou type gospel feel to it, complete with a chanting section,” says Daughtry, a North Carolina native who released his band’s multi-platinum debut album—the fastest selling debut rock album in Soundscan history—just months after his fourth place finish in Season 5 of American Idol. One of the most successful former contestants in Idol history, Daughtry and his band have scored four #1 hits on the Billboard Adult Top 40 chart (“It’s Not Over,” “Home,” “Feels Like Tonight” and “No Surprise”), earned four Grammy nominations (including Best Rock Album for their debut Daughtry), won four American Music Awards, sold over 7.5 million albums and 17 million singles. In addition to various tours in the U.S. and Canada, the band has performed everywhere from the UK and Germany to Singapore, Russia and South Africa. Daughtry also co-headlined a U.S. tour with 3 Doors Down. The group’s follow-up albums to Daughtry have kept their momentum going, with Leave This Town marking their second consecutive #1 on the Billboard 200 and Break The Spell (2011) hitting the Top 10 and achieving gold status within a month of its release. Daughtry the band is also using its global popularity to raise awareness about a number of charitable causes, including an ambassadorship with DC Comics’ We Can Be Heroes campaign. Early on in the process of crafting a follow-up to Break The Spell, Daughtry made a conscious decision to approach the songwriting and production from a different angle. He sought out Johnson (Boys Like Girls, Hot Chelle Rae, Taylor Swift), Kelly (Britney Spears, Kelly Clarkson, Bruno Mars) and Hollander (Train, Neon Trees) to write with, but originally intended to record the final tracks with his bandmates—who do not appear with the singer on the final product. Daughtry chose his wish list of producers—which ultimately included Rock Mafia, busbee and Jake Sinclair—based on his admiration for their previous work, but was still happily surprised by just how strong his chemistry was with some of them. Both sonically and lyrically, he cites Kelly and Johnson as helping push him to creative heights he had never imagined for himself. “At first,” he says, “it’s all about testing the waters, but then I got in the room with Claude and there was an instant connection that led to ‘Baptized’ and ‘Broken Arrows,’ some of the best songs I have ever come up with. Likewise, Sam and Martin were pulling things out of me that no one ever has. The challenged me to go somewhere funny, and be a little more witty. The way we address my rock heroes on ‘Long Live Rock and Roll’ and that line in ‘Waiting For Superman’ about washing the cape at the Laundromat is pretty hilarious. No one I’ve ever worked with before evoked that kind of humor out of me.